After a disastrous meal at Khaabar Baari restaurant on 73rd St in Jackson Heights NYC, an intriguing question came to my mind. 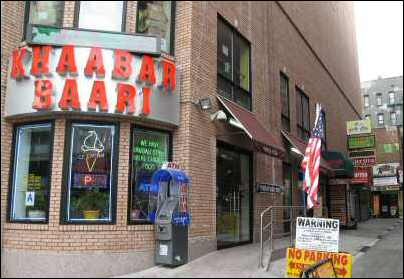 Why does Khaabar Baari restaurant even exist? My simple answer - To torture hapeless diners that walk into its premises nourishing hopes of a decent meal. "We Offer Bangla Style Halal Chinese Food". We took the bait and walked into Khaabar Baari Bangla Restaurant. If you are an ardent lover of Indian-Chinese food like me you would know that the Chinese who migrated to Kolkata are the creaters of the famed manchurian and other Indian-Chinese curries. As we walked in around 10:30 am, the restaurant had just two diners and a waitress was busy cleaning the tables. We politely enquired whether restaurant was open for business and what was available. The waitress immediately started speaking in Bengali. I had to stop the waitress and tell her in English that I was not familiar with Bengali. Then she listed out Chicken Biryani, Goat Biryani and Chicken Curries. We quickly interrupted her and enquired about Bangla Style Halal Chinese items. Much to our utter disappointment, the waitress dismissively responded Oh! they are not available now may be after 1 PM. In retrospect, our mistake at this point was not walking out. Instead, we sat down and ordered Chicken Biryani. Since my buddy was a vegetarian, we enquired about vegetarian curries. Mixed Vegetable Curry was the only one available during our visit. Hence we ordered one Chicken Biryani ($6), One Mixed Vegetable Curry ($4). Since Mixed Vegetable Curry does not come with rice or bread, we added one roti ($2). We also asked for a cup of Tea. To describe Khaabar Baari restaurant's Chicken Biryani as awful would be an understatement. It lacked the magic and aromatic flavor of Biryani spices - be it Cloves, Marathi Mogga, Cardamom, Cinnamon, Nutmeg, Bay leaves, Garlic, Ginger, Mint leaves, Pepper seeds. No I did not find evidence of any of these spices being added. 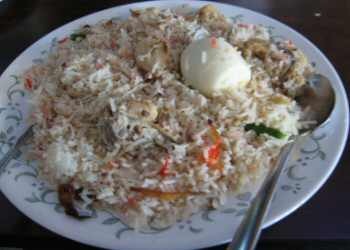 Chicken Biryani tasted as if boiled chicken was added to cooked rice as an afterthought. Sure it included a boiled egg but what gives the Biryani it's magic flavor is the spices and not the boiled egg or the raw whole green chilli toppings. A delicious Biryani is prepared by cooking rice, spices, chicken and vegetables together on a medium to slow flame for several hours. Chicken Biryani dished out by Khaabar Baari Bangla restaurant was low on Biryani spices and, worse, low on a competent Chef's hands. Chicken Biryani was so tasteless that I could not push more than a few spoons into my mouth and had to leave most of it in the plate. If you love Biryani as much as I do, I suggest you head to Dakshin Express on Oak Tree Road in Edison or Persis Biryani in Hamilton New Jersey. After being badly stung aving by the awful Chicken Biryani, I turned to my buddy's Mixed Vegetable Curry order and the roti. 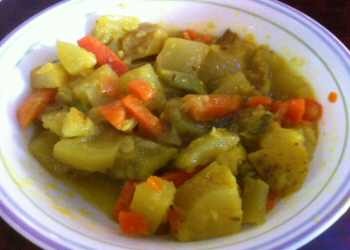 Mixed Vegetable Curry looked promising with cubed Potato, Zuchni, Squash and Carrot with a dabbing of yellow color. However, the joy of seing variety of vegetables was shortlived and I felt like throwing up soon as a spoonful of curry touched my tastebuds. For the Mixed Vegetable Curry was truly a mix of boiled vegetables without any seasoning or flavor other than the turmeric powder that gave its yellow color. Roti was served hot in a basket. 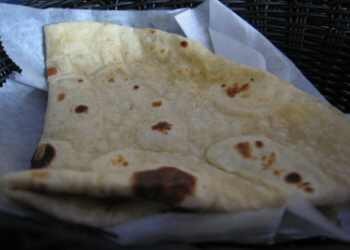 Roti was soft and seemed freshly prepared. 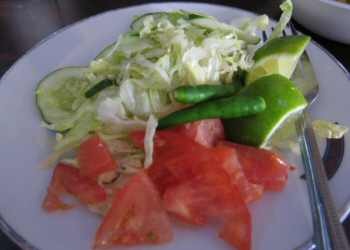 But in the absence of a proper side dish, I could not enjoy the roti. Much as I hate wasting food, we had to let most of the Roti and Mix Vegetable Curry go waste. Sometimes in life when it rains it pours. Even the salad that came with our order was unpalatable. You see it was plain raw vegetables and did not include any kind of dressing or even a dash of olive oil. Our order of Tea came hot to the table. That's all I can say in its favor. 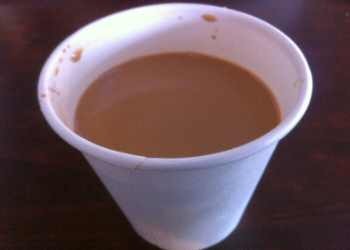 Tea was smelly and tasted as if it had been sitting in a flask for a long time. Needless to say, I did not enjoy the flask smelling Tea. Starve if you must but avoid Khaabar Baari Bangla restaurant. For Khaabar Baari Bangla restaurant punishes hungry diners with awful food. My Khaabar Baari Bangla restaurant visit gave me immense buyers remorse. Also, vegetarians must avoid Khaabar Baari Bangla Restaurant as just one vegetable curry was available during my weekend visit. BTW, Khaabar Baari Bangla restaurant charges tax only on credit card payments and not on cash. When I gave my credit card to make the payment, the waitress at the cash register informed me that she will have to add tax for credit card payments.